What is the Winter 2019 Limited Collection? It consists of a limited release of razor handles that come in new and exclusive finishes. These will be available in limited quantities starting in December 2018. All Winter 2019 Limited Collection handles ship with one Fusion Proglide® Blade, and will be delivered within 3-4 weeks of order placement. Razor Maker™ allows you to create your own totally unique razor handle using 3D printing. Choose a base design and customize it with your preferred shaving technology and color. Add a name if you’d like. Once you have fully configured your personalized handle we make your razor to order and ship it directly to you. Who can use Razor Maker™? Razor Maker™ is currently only available for shipping in the U.S., but we hope to make it more widely available in the future. What can I buy on Razor Maker™? Along with your personalized razor handle, you can purchase additional blades. How can I customize a razor handle? First, choose a base design from the Razor Maker™ library. Some of our best designers have created unique and exciting razor handles for you to begin your customization, and we plan to grow our library in the future. Next, select the shaving technology you desire, pick your preferred handle color and add a name to the handle (12 characters maximum). While we accept most text customizations, there are some that we will not be able to produce. These include obscene or abusive language, anything that is deemed offensive, or trademarks & slogans that we do not have the right to use. Razor Maker reserves the right to decline a customization at any stage of the order process and will contact users if this is the case. Full details can be found in our terms and conditions. Would Razor Maker™ make a good gift? Absolutely! Our handles can be personalized with any name (maximum 12 characters) and ship in a beautiful presentation box. They make a wonderful and unique gift. What blades can a Razor Maker™ handle use? Razor Maker™ allows you to choose between two of Gillette’s best-known shaving technologies: Mach3® & Fusion5™. A Mach3® Razor Maker™ handle will take any Mach3® family blades including Mach3® & Mach3® Turbo. Why are you using 3D Printing? 3D printing allows us to create shapes and handle forms that are almost impossible to make by other methods. It means we can bring your handle to life especially for you, and it lets us constantly add new designs to our library. What 3D printers do you use? We developed this process in collaboration with the 3D printing experts at Formlabs (https://formlabs.com/) and use their amazing Form 2 printers. Stereolithography (SLA) 3D printing is an additive manufacturing method – you start with nothing and build the shape you want. The Form 2 3D printers that build our Razor Maker™ handles work by photopolymerization, a process that uses light to turn a liquid resin into a solid plastic. After our website builds a digital, 3D model of your custom razor handle, we load those specifications into the 3D printer. The printer then uses a laser to draw the model into the liquid resin. Where the laser hits, the resin becomes a solid and the handle grows layer-by-layer from the resin and becomes reality. Your order goes to our production facility just north of Boston. We 3D print your handle and assemble it with genuine Gillette components to complete your unique Razor Maker™ handle. We carefully place your personalized razor (along with any additional blades you purchased) in an upscale, giftable box before packing it to ship directly to your door. Will my order come with a blade? Yes! All our orders ship with one blade attached to the handle. You also have the option to add an additional four blades. Customized razors start at $19.00 and go up to $45.00. This includes shipping and one blade. An additional four blades for your razor can be added for $15.00. Every Razor Maker™ handle is created uniquely to order. We aim to deliver every handle within 3-4 weeks of order confirmation, but we will do our best to send it much sooner than that. We start producing your razor handle right away. Therefore, modifications and cancellations are not possible. Is Razor Maker™ part of Gillette? 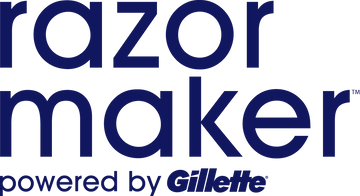 Razor Maker™ was set up by and is powered by Gillette. All our components and blades are genuine Gillette. How strong is my handle? We are using very strong and durable materials, developed by Formlabs, to build our razors. In normal use the razor handles should not break. However, because these are 3D printed they are not as strong as a ‘normal’ metal razor, and we ask you to be careful. Please do not drop the handle. If you do drop it, we recommend you change the blades before shaving. If the handle breaks please do not continue using it.